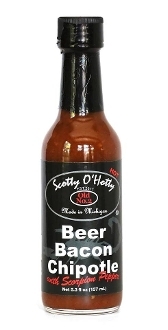 The hot version of our world famous Beer-Bacon Chipotle Sauce. We have combined the three major food groups into one savory, smoky, beer bacon delight. This delicious sauce can be used on anything from burgers, brats, dogs & steak to tacos, chili, pasta & fish. The “hot” version is for the more experienced chili heads & taste tested by some of the best culinary experts in the country. We've been told "the BBC is the best bacon sauce in the universe!" Are you ready to get stung?